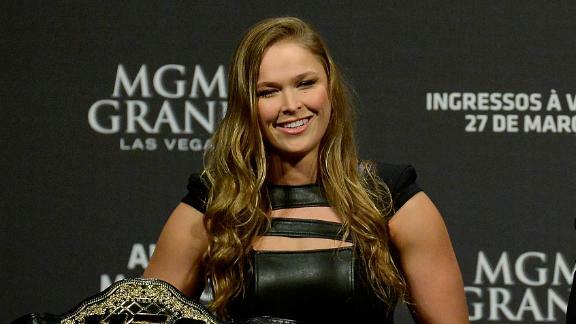 UFC women's bantamweight champion Ronda Rousey discusses the progress made in women's mixed martial arts, her belief in herself, and a comment made by former boxer Laila Ali that she could beat Rousey. Between her dominance in the Octagon, her Hollywood turn in "Furious 7" and the upcoming "Entourage" movie and her WWE WrestleMania appearance, Ronda Rousey is clearly the "It Girl" of the moment. However, it seems like one major corporation is firmly not on #TeamRousey. With her memoir "My Fight/Your Fight" set to be released next month, Walmart has announced it will not be selling the book because it's too violent. If you're currently muttering to yourself "Doesn't Walmart sell guns in its stores?" know you're not alone in your thinking. Rousey's sister Maria Burns Ortiz, who co-authored the book, posted a similar sentiment on Twitter. To recap: According to Walmart, Ronda Rousey is too violent but guns are totally cool. OK then.